A digital mailroom powered by enterprise-level capture converts incoming documents/files, not only originating from mail or fax, but also originating from email, multifunction peripherals (MFPs), web portals, or mobile devices and tablets – into structured electronic information, that feeds multiple business processes and systems across the enterprise. ‘Digital mailrooms’ automate the capture of all incoming mail, whether delivered on paper, in an email, via fax, or at the Point of Origination (MFP, web portal or mobile/tablet device), and deliver structured electronic information. In order to initiate or continue business processes, each mail piece is characterised by type and structured information is extracted and delivered in the correct format to the correct process. Manual processes for managing high volumes of information from a wide variety of sources are eliminated. getsix® offers a best-in-class, highly efficient, ISO 27001 compliant ‘Digital Mailroom’ facility with Software-as-a-Service (SaaS) capture services optimised for documents of all types. getsix® can accept documents of any type, in any form via mail, courier, FTP, remote capture, EDI, you name it. It does not matter in what format we receive your documents, we process them all through the same proven, reliable system. 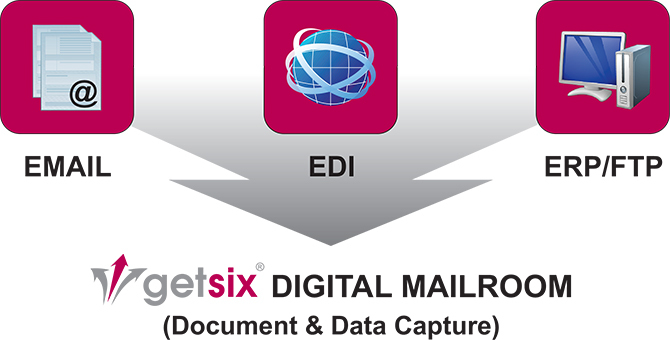 getsix® ‘Digital Mailroom’ serves as the front end to our Software-as-a-Service for document and process automation. So if you choose getsix® workflow for invoices, order processing, or you use our ‘Virtual Personnel File’ capability for our HR Solutions, all documents will be collected through this facility. Because getsix® already has this established process in our ‘Digital Mailroom’ that has been perfected for all document types, you get to skip the high capital costs of setting up your own scanning and capture operation, buying specialised software, including high priced consultants to implement, and then the high labour costs associated with the inherent learning curve to optimise your in-house process. getsix® utilise our high speed scanners for paper documents with the latest combination of technology and people. By bringing together a highly evolved SaaS system with human verification by our expert staff with many years of experience, you get a very accurate, low-cost and dependable document and data capture process. This sophisticated technology is set-up, running and processing thousands of documents each month. For this reason, getsix® can offer you a rapid conversion from your paper processes, to the most appropriate level of document and data capture, and give you the lower costs that result from automation. Capturing email and other electronic documents received in files shares or through web services, as soon as they enter our organisation, we are turning them into actionable digital information, and routing that information to workflows, processes and applications according the specific needs of our customers. This is the key to automating document driven business processes and achieving operational excellence and sustainable cost reductions. Monitor the complete inbound capture process from a single application and provide chain of custody independent of the source or location of the business documents. How do getsix® mailroom services for incoming e-Files work? Capturing email, fax and other documents received in files shares or through web services which we receive from our customers, turning them into actionable digital information as soon as possible and routing that information to workflows, processes and applications is the key to automating document driven business processes and achieving operational excellence and sustainable cost reductions. Automating document driven business processes and achieving operational excellence and sustainable cost reductions is the value of our digital mailroom services. To handle incoming e-Documents like e-Mail attachments i.e. PDS’s, XML-Files or any other formats with our ‘Digital Mailroom’ services we have developed and implemented several Data Gateways which are working like Digital Hubs for our Customers. 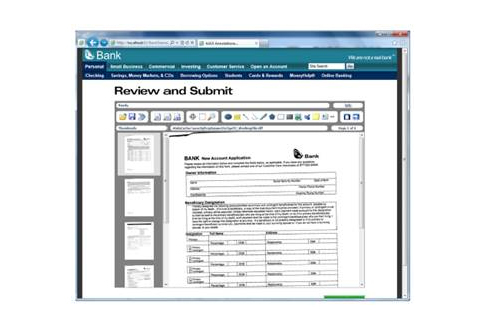 Working in the background, our software detects any file attachment (PDF, TIF, PNG, etc.) and immediately transfers it to the capture solution. The main benefit is that emailed data is automatically processed, just like paper documents. Depending on your settings, your incoming attachment may be ready for downstream processing in a matter of seconds. Improve control -Email is sorted automatically and all sender information is retained. FTP, or file transfer protocol, websites facilitate the downloading and uploading of files on the internet. There a number of advantages of an FTP server over other file-transfer options. Many network copiers now function as multi-function devices – they can not only copy, but scan documents, email them and some can send directly into other software programs for further processing. Still, most MFD’s are used to copy or scan documents to a network drive. From there, our customers can use our getsix® FTP Gateway to just upload the respective documents to us for further processing. What are the benefits of the getsix® FTP Gateway? getsix® FTP Gateway allows easy transfer of files via a drag-and-drop interface, similar to Windows Explorer. This grants an ease of transfer not afforded by HTTP. FTP grants greater efficiency when transferring large files and limits the file size only by the amount of space on the server. Unlike email, large files would not need to be broken into smaller parts. FTP also enables automatic resumption of file downloads or uploads without a separate download manager; this is especially beneficial to users with slow or unreliable internet connections. To limit access to files, FTP has a host of security features, including user authentication and secure transfers with encryption protocols such as SSL and TSL. This ensures data access only to authorised users without the possibility of someone intercepting decipherable data. The Kofax Web Capture™ application enables us to operate a scan and image enabled customer-facing web portal which is integrated in our Customer Extranet. 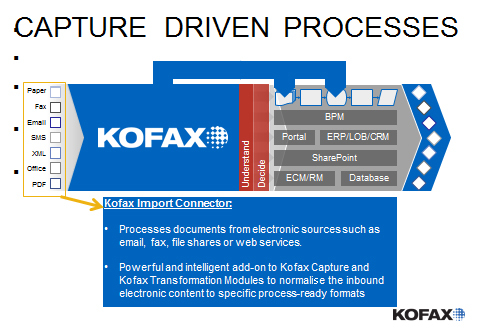 Kofax Web Capture enables us to offer our customers to efficiently capture any content directly where documents are received – whether in the central office, remote branches or home offices. Rather than requiring our customers to bring the content to a centralised capture platform, our customers can capture and submit to us the information as soon as it is available and feed content through a common set of business rules for document processing, classification, data extraction and purification. To enable the capture of your documents you simply need to be connected to the secure getsix® Web Portal and scan or import documents before sending a process order to our service. With our simple approach you can transmit your documents by email or fax after scanning. You can always keep your original documents whether paper or electronic. Improves data accuracy and reduces error rates.